A great new add to 7pace Timetacker’s latest release, 4.23, is the ability to now set “Billable” as the default for all your worklogs! You’ll find this new setting under the “Configuration” tab of 7pace Timetracker. 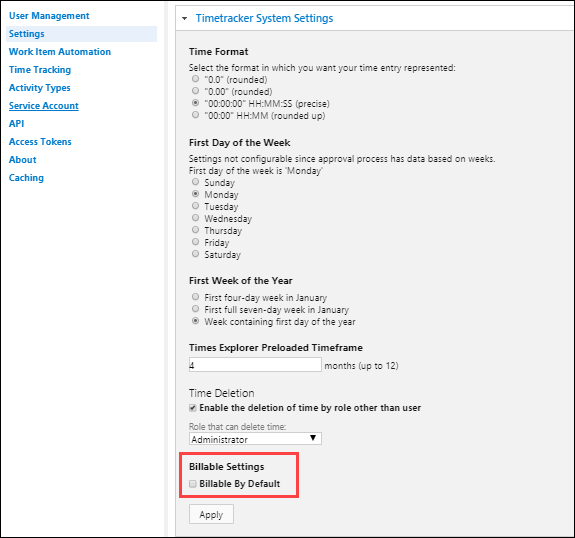 With the “Billable as Default” checkbox enabled under Settings -> Timetracker System Settings, every new worklog will be logged as billable (billable time = period length). We’ve also added the total number of billable hours for each budget to the “Budgets” page. Under the “Configuration” tab, “Activity check” settings were moved from “System Settings” to “Time Tracking” -> “Personal Settings”. This is no longer just an administrator function, and now all users of 7pace Timetracker have the ability to enable the “Activity check on time tracking” setting themselves.